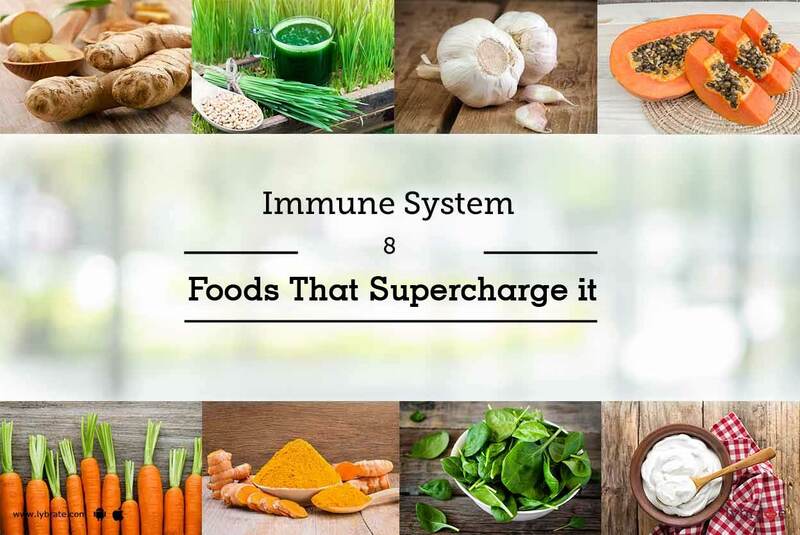 The immune systems in your body are always at work trying to fend of many of the attacks that happen on it every day. Although it is able to protect the body most of the time, sometimes it fails in doing so. Ginger - This food item is very good in regulating mobility within the gut and regulating bowel movement and is also known to relieve nausea, cramping and bloating. Ginger is also known to have many anti-inflammatory properties as well as being an antioxidant and antimicrobial. All of this makes ginger very good for the immune system. Wheatgrass - One of the most densely packed green nutritional food ingredients when consumed in the form of a juice, it helps the liver by increasing its ability to flush out toxins. This results in an improved immune system. Wheatgrass is also rich in B complex vitamins, beta carotene, chlorophyll, magnesium, potassium and many other vital nutrients. Garlic - This vegetable has been used for centuries in home remedies such as to lower blood pressure, prevent blood clots and many others. Garlic is also known to boost healthy cholesterol. Inclusion of garlic in your diet will not only boost your immune system but it also contains 'allicin', which is known to improve the health of your heart. Papaya - An extremely good food for digestion as well as digestion problems, the extracted enzyme from this plant known as papain, is used in many medications. Papaya is full of beta-carotene that is very well known to be good for the health of tissue, skin and the eyes as well as boosting the immune system through the production of vitamin A within the body. Carrots - This is one vegetable which has been encouraged to be included in diets as it contains copious amounts of beta carotene and is extremely good for the eyes as well as boosting the immune system. Turmeric - Possibly the most talked about ingredient on this list in the last few years, it is known to have almost an unending list of health benefits. Turmeric has detoxifying properties as well as being anti-bacterial, anti-inflammatory and is great for digestion along with boosting the immune system. It is a rich source of minerals, such as Zinc, Iron, B group vitamins and Manganese, turmeric is also known to have cancer preventive properties. Spinach - Being high in fiber and loaded with Vitamin C, Folate and other powerful antioxidants it helps building strong immune response and ensure overall wellbeing. A special care is to be taken that it should not be consumed raw, as the level of oxalates is considerably high, which can lead to the partial absorption of the important nutrients. Yogurt - Yogurt being high in probiotics, which helps food move through the gut. It also helps in improving bone health. It helps in regularising digestion and reduce the symptoms of Irritable Bowel Syndrome(IBS), since it is digested easily by human body.